Team membership is by invitation only. Requiring more of a comitment, it's purpose is to give extra gymnastics training as well as an opportunity to compete with other gymnastics schools. We strive to promote loyalty, respect, self-confidence and self-discipline to their fullest, while bringing out the participant's finest gymnastics abilities. Our team program begins with our boys and girls pre-teams. These are non-competitive teams, and are comprised of 5, 6 and 7 year old children. Next we have a series of teams based on the ability level of the athlete: teams "D" through "A". Our team program involves training from two hours per week, up to twenty hours per week, depending upon the level of the gymnast. The competitors are trained with USA Gymnastics routines. 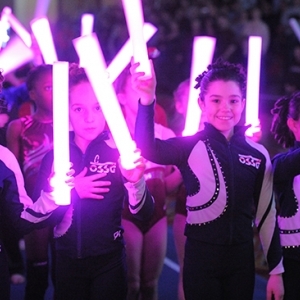 The "USAG" is the organization which developes the Olympic routines and programs. It is also the program which SAFETY CERTIFIES our instructors.